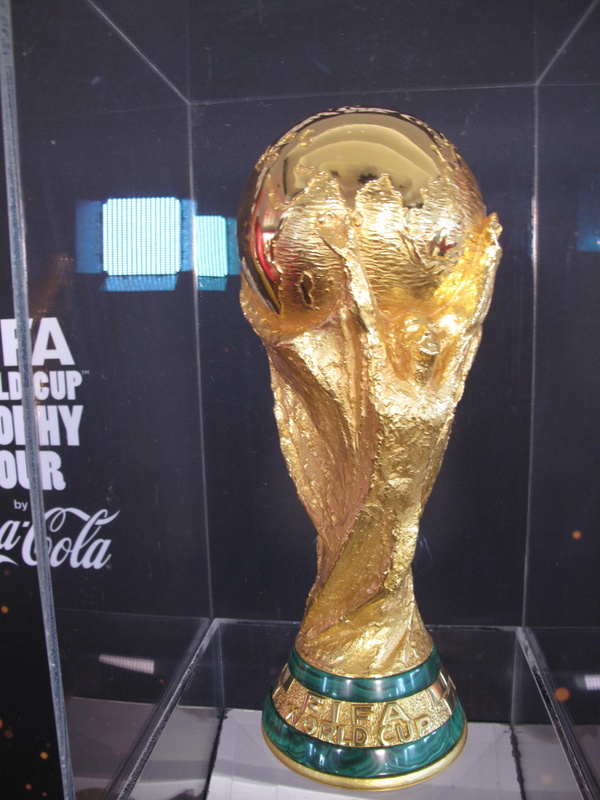 I had seen the posts on Facebook and Twitter: The FIFA World Cup trophy is currently on a world tour. A huge world tour – they are covering 80 countries. 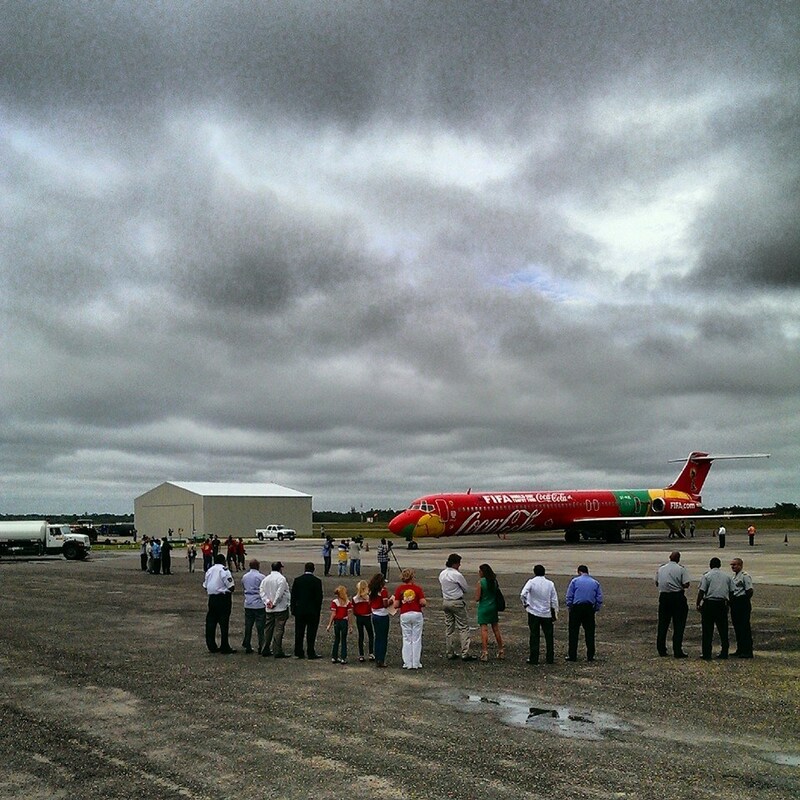 A tour to help build excitement for 2014’s World Cup tournament that will take place in Brazil. And honestly? My initial reaction was not one of great excitement. I had actually never given the World Cup prize a moments thought. For all I knew, they could have given out medals…or ribbons…or flowers to the last winners, **please pause so I can google who they were** SPAIN! Oh look…they get medals too! I didn’t receive a press invitation or a free ticket so I decided to leave this one completely up to chance. A small amount of tickets had been given to the phone companies Digicell and Smart. Send them a text and you might win a free entry. I pretty much thought I had no chance. I sent one text and WON. Fate. Kismet. 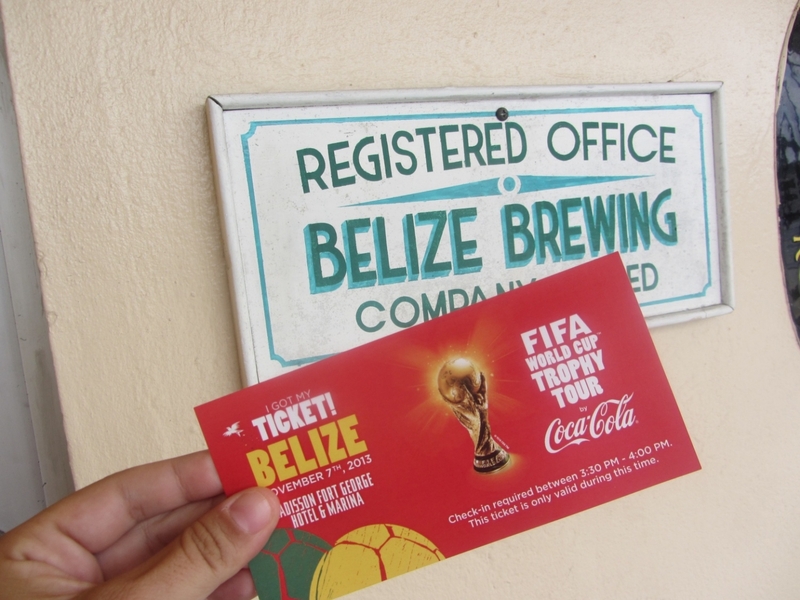 I was MEANT to see the World Cup in Belize. 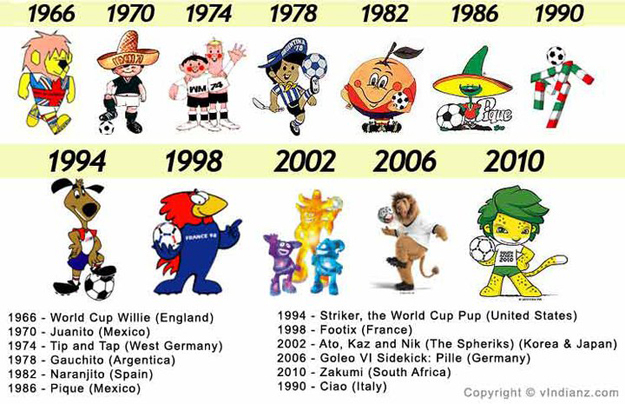 Check out ALL the information of the Fifa Trophy tour link. It’s pretty interesting. This cup is on the move! And yesterday arrived at Belize International Airport (from El Salvador) in fully branded style. Now THAT’s a plane. 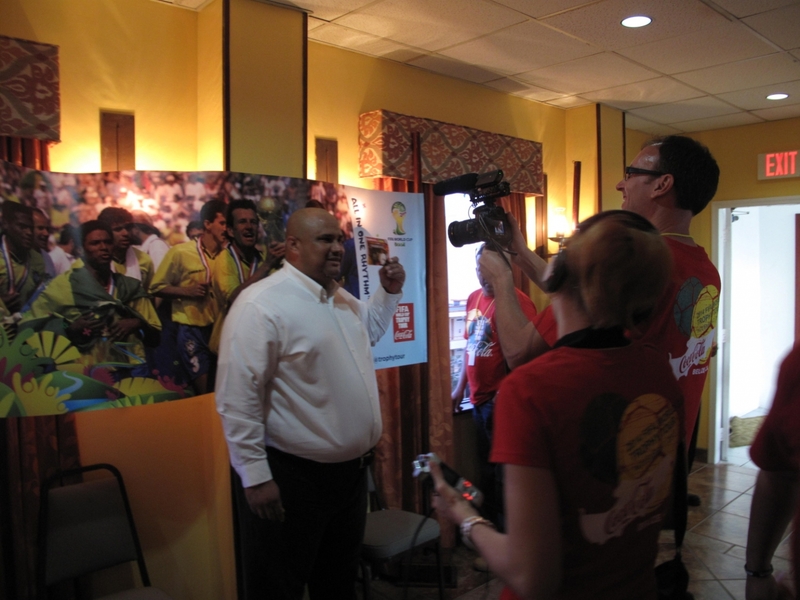 And they were met by over 15 members of the Belize press. Picture borrowed from the Bowen & Bowen facebook page. I stopped into the Belikin distributor on Kings Street in Belize City to pick up my winning ticket. And my taxi took me straight over to the Radisson Hotel. There were quite a few banners downtown. Here is one right in front of Wellworths. The area was roped off and there were plenty of unarmed and armed security guards. 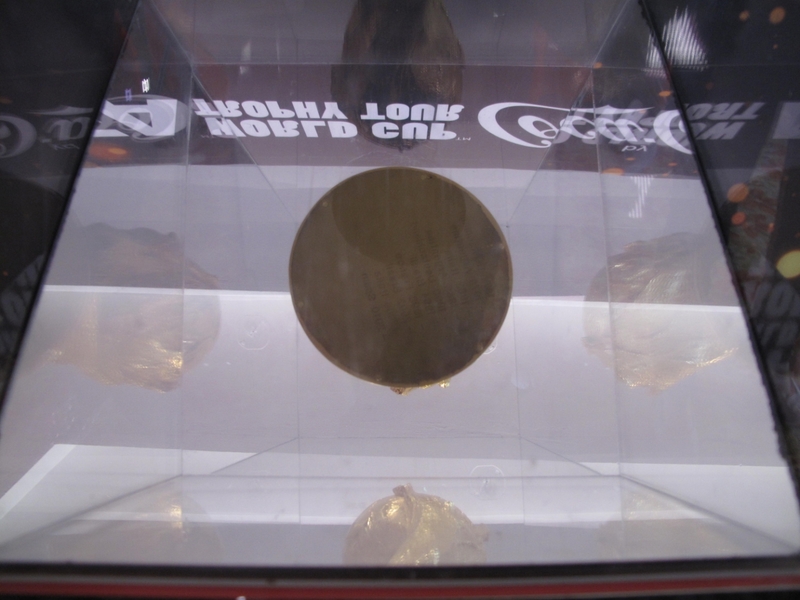 Interesting…apparently this trophy is not made of plastic. I got my ticket punched and went right up to the 5th floor. There were quite a few people coming out but I seemed to be the only one going in. Perfect. I had time to get a serious close up. When the cup is awarded, it is taken away from the winning team almost immediately or, I forget, maybe they don’t touch it at all. The team is then given a gold plated replica with only the year and the championship on it. So…2010’s said something like “2010 South Africa”. The team name/country is ONLY engraved on the bottom of the REAL deal solid gold cup. Also, the real cup and the awarded replicas can never be on public display at the same time. This must be a terrible scheduling hassle. Here is my bad attempt to photograph that. It starts in 1974. This cup has only been on a world tour three times starting in 2006. 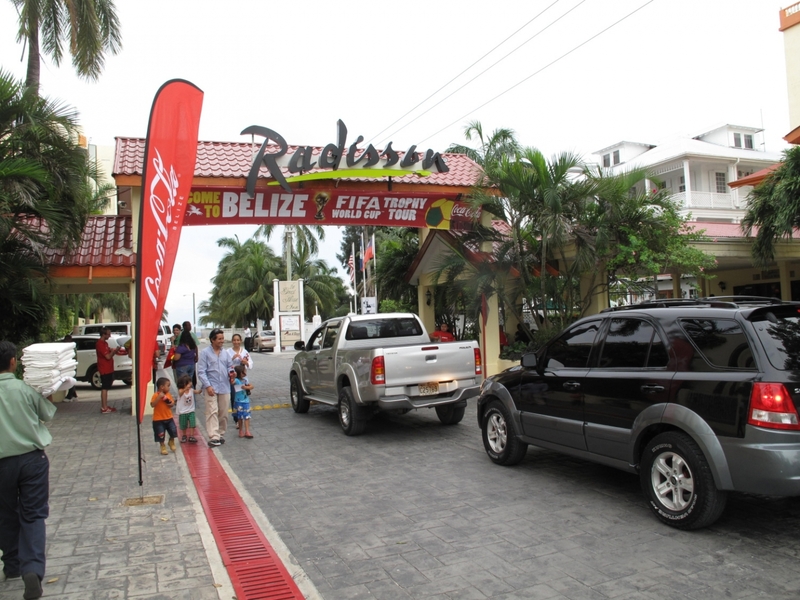 This is the first time that the cup has been to Belize. Exciting since this year is the closest Belize has ever come to qualifying. The previous cup was stolen twice. Once in 1966 in England and was recovered. And then again in 1970 in Brazil. The assumption is that it was melted down by the evil criminals. And I took my picture with it! It’s not my taste in design but it’s actually very very impressive. And there was a buzz in the room. People were really really excited to see this. Like this young couple from Georgia, USA. 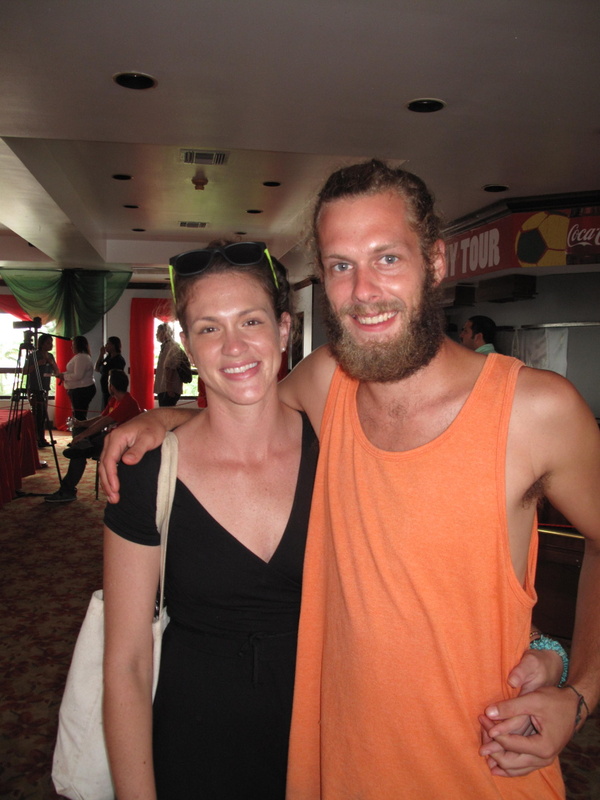 They have lived in Belize for 2 months now in a little village called Valley Community. A village so small that I can’t find it on a map but I think it’s out on the Hummingbird Highway. At least 3 or 4 hours by bus. 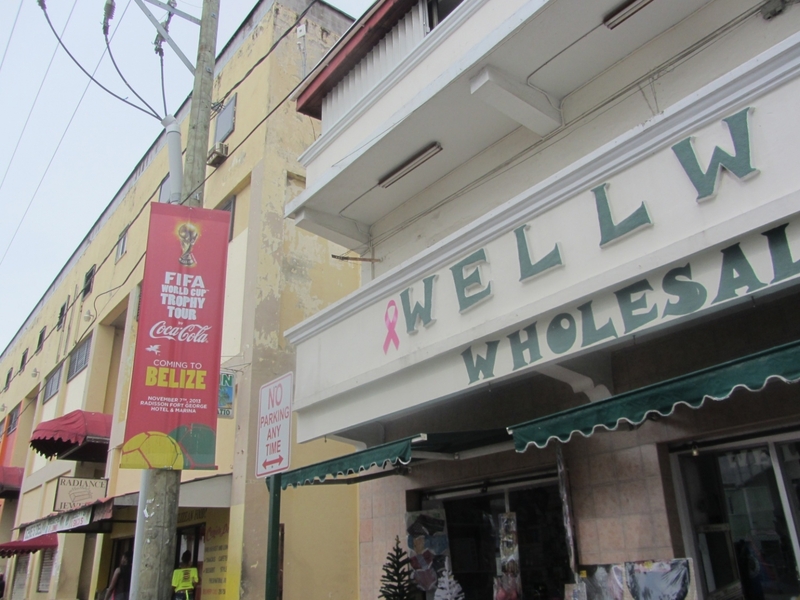 He saw a poster at the local store this morning and knew that he HAD to get to Belize City to see the cup. They jumped on the bus only to arrive at the Radisson and find out that they needed a ticket. 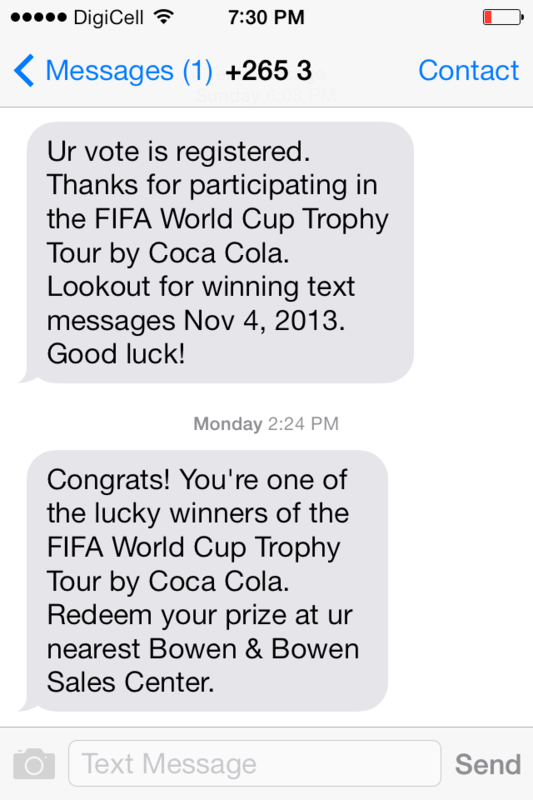 The lovely people at Bowen & Bowen heard the story and…what could they do? They let them in. Here is my buddy Jorge of the San Pedro Sun horning in on my scoop. 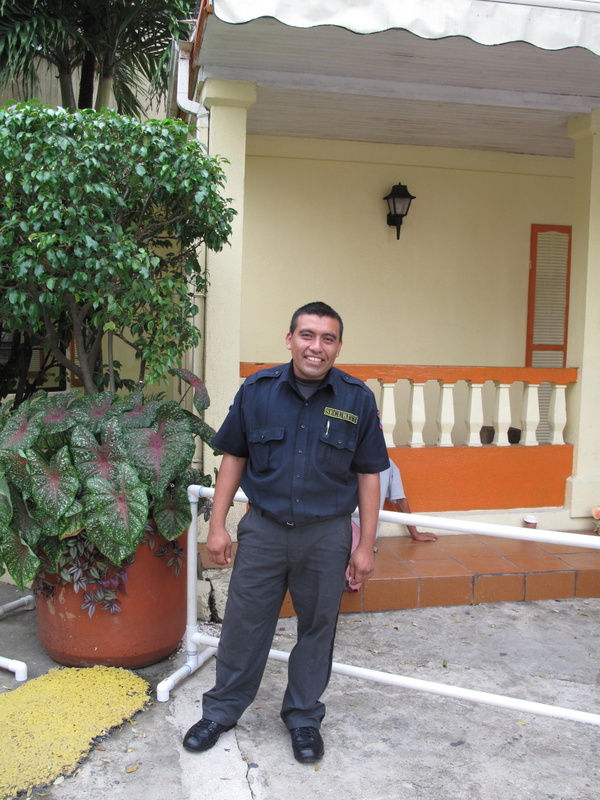 Jorge! There were quite a few VIPs in the building. Here is the Speaker of the House of Representatives being interviewed. Some members of the Belize national team were arriving when I was exiting the building. I’ve actually seem met many of them a few times. 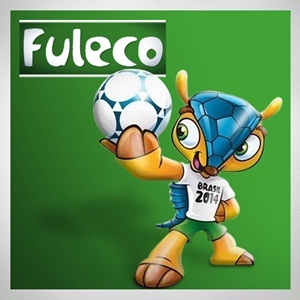 The FIFA website says that Fuleco, the 2014 mascot, is travelling with this tour to some of the destinations…based on the size of this suit? I’d guess only cold weather ones. I don’t really know…were design professionals involved in any of these? The new armadillo is definitely my favorite. In the end, this was a super cool experience and I’m glad I showed up. The cup is very very impressive and I love that they stopped in to this little country to help spread the World Cup Fever. Next stop? Israel, Palestine and Jordan. And I did some googlin’. 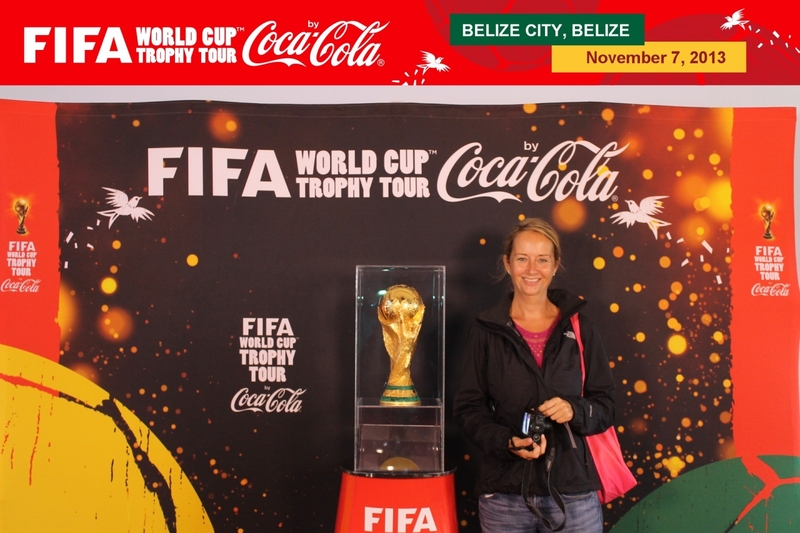 Belize is not the smallest country (population-wise) that the cup is visiting. And it’s not really in order. They come back to visit Guatemala and Mexico in February. How did they pick the countries? Ha…it’s not ALL fun and games. Just mostly fun and games. Pretty cool! But I’m curious about your fallish looking clothes. A jacket even? In Belize? Do tell! It’s still quite warm but I am a big baby about AC. I had a HUGE lunch in Belize City…Indian…and the air con was killing me.